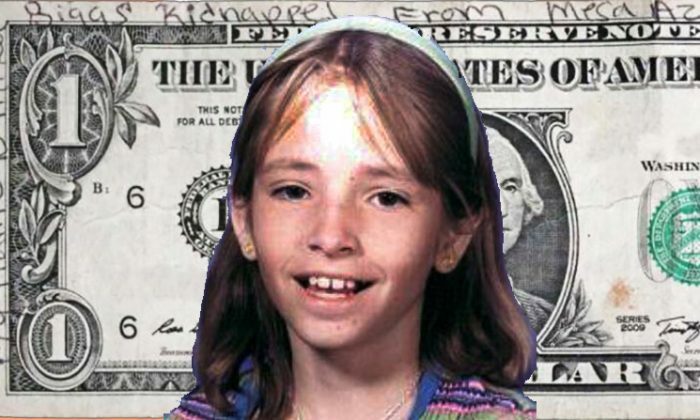 A possibly faked message on a dollar bill seen in Wisconsin mentions an Arizona girl who disappeared in 1999. The bill, printed in 2009, turned up on March 14 in Neenah, Wisconsin, has a message scrawled along its border: “My name is Mikel [sic] Biggs kidnapped From Mesa AZ I’m Alive,” the New York Post reported. Eleven-year-old Mikelle Diane Biggs disappeared from the street in front of her home in Mesa, Arizona, on Jan. 2, 1999. Mikelle and her 9-year-old sister were waiting in for the evening visit of the ice-cream truck outside their suburban home. While her younger sister ran inside to get a jacket, Mikelle rode her sister’s bicycle in circles on the street, waiting. When her sister returned, the bike was lying unattended in the street and Mikelle was nowhere in sight. She has not been seen to this day. Police are fairly certain she was taken against her will. The bike and the money she was carrying to buy ice cream were found in the middle of the street. “It wasn’t somebody that she knew or wanted to be with,”Mesa Police Detective Jerry Gissel told ABC News in 2009, the Arizona Republic reported. Mikelle’s disappearance sparked a huge search, but despite collecting more than 800 pieces of evidence and screening more than 10,000 tips, police never came up with a suspect or even a solid theory of where the young girl went, the Arizona Republic reported. Police investigator Adam Streubel, of Neenah, Wisconsin, doesn’t believe the message on the bill is genuine. Streubel noted that the handwriting is childish, shaky, and Mikelle’s first name is misspelled. The bill was printed in 2009, so Mikelle would have been at least 21 when the note was written. On top of that, there would be no way to know when or where the note was written. It could have been penned last year by a Wisconsin resident playing a prank, or at any time since 2009 and in any state in the nation. No one in the Neenah Police Department had heard of the Biggs case, he said. Despite the note probably being a fake, Mesa police are going to investigate.